Between us, we’ve lived in Utah for decades, and even though we've traveled many places around the world, we'd never been to the Bonneville Salt Flats -- a world famous place less than two hours from Salt Lake City. ---Ask somebody from somewhere else what they think of when they hear “Utah,” and the top five responses will usually be, “Mormons, skiing, Jazz, Olympics and Salt Flats,” in some order. We’ve seen the Salt Flats on our road trips to the West Coast and we always thought it would be a good place to hold a fiesta, make some ice-cold margaritas and just reach down and roll the rims of the glasses around on the ground. However, after going out to Wendover (don't worry, we didn't take the Fun Bus; that’s a whole other story we’ll cover in City Weekly another time) and getting to spend the day at the World of Speed, we've added the Bonneville Salt Flats to our "why didn't we do this before" list. Apparently, many other people from around the world caught on to the place before us. At the team and driver's meeting in the morning, the director asked for a show of hands of people who were visiting from outside the country and about a third of the hands went up. When he asked for a raise of hands from anyone who had traveled over 1,000 miles to get to the event, well over half the crowd had an arm up. It's hard to think of a spot on Earth more accurately named than the Salt Flats, since those two words tell you exactly what you'll see for miles and miles. It's one of the few places you can go and find yourself wondering, "Am I still on planet Earth?" The World of Speed continues through Sept. 11, and there's also the Top Speed Shootout next weekend and the World Finals in October. If you can't get out here on those dates, try a tour with Intermountain Guide Services. They'll take you around the flats and explain how they got to be such a natural wonder. What's interesting about the speed events held there is that even though the teams and drivers are setting world records,they are very accessible and happy to talk with anybody who's interested in talking about the machines they've spent months, or years, working on. The whole event has a delightful "family" feel to it, as many of the teams are close friends and relatives who work together to build the cars and then drive them. We met the "World Record Racing Team," which largely consists of the Youngblood family out of Davis County headed by Don, the dad, who's been building cars for 50 years. Last year, his son J.D. Youngblood set a world record in the H class of cars, only to have his sister Ali Youngblood break his record. "I had never been out here before," said the mother of three, who is a bio-chemical engineer for a pharmaceutical company by day and world-record chaser on weekends. "I just came out here [last year] to support my brother and then I broke my brother's record using the same car." There are no hard feelings; though; just another way to bond as a family. Instead of having the siblings share the car, they just went back to work building a second one in a different class so they could both drive one. When Ali gets in her car, the only person she will let help her finish setting up and strapping in is her brother; she won't drive with out him. On Saturday, she was looking to break her own world record of 149 mph. 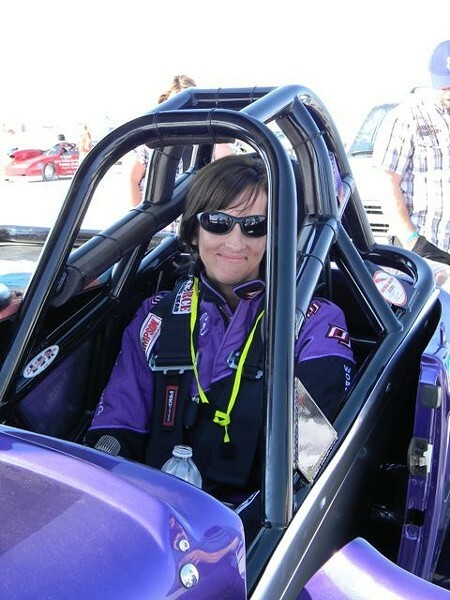 Driving an H class motor -- which is basically a motorcycle engine -- surrounded by a purple chassis, she easily broke the 150 barrier, topping out at 159.97 and notching another new mark in the record books. We were lucky enough to get to participate in the event with the Youngblood family by riding in the “push car”. Since the way the gears on the cars are set up would be like trying to start a typical stick shift in fourth gear, they need a push to get going. We rode in the back of the push car that got Ali going for the first quarter mile before she pulled away and into the record books. Here's what it looked like. As we travel around the this amazing world, we’re glad we got to experience this place that is so close to home. 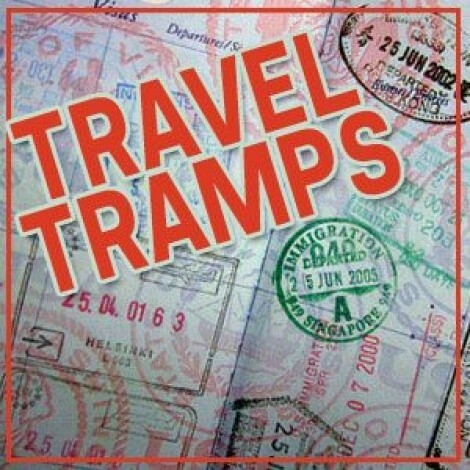 The Travel Tramps write about their treks near and far for City Weekly and also host the weekly Travel Brigade Radio Show. You can follow them on Twitter @TravelBrigade.